Tales from a Pale Blue Dot: ¡Ay, caramba! Do not go swimming off the docks!! We recently returned from Puerto Vallarta where I made a surprising discovery. 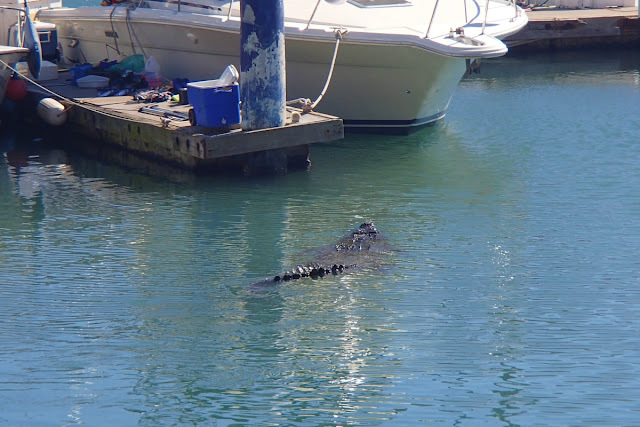 While waiting in the local marina for a bus ride, I glanced out over the water to see a 10-foot alligator lazily swimming among the yachts. Locals working on the jetties didn't give it much attention, so they are obviously native to the area. We've been to Mexico numerous times and this is the first time we had ever seen one. I guess when you consider that alligators stroll the golf courses of Florida, it's not such a surprise, but it's still disturbing to see them so close to civilization.